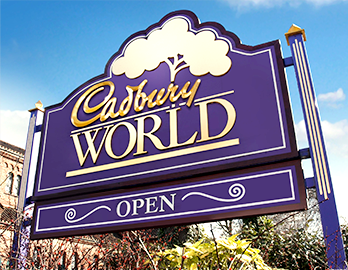 Cadbury World is an adventure into the world of chocolate. From humble beginnings in a shop in Birmingham the Cadbury brothers created a chocolate empire that has factories around the world. The Cadbury factory at Bournville has a visitor centre that is dedicated to the history of chocolate. Both educational and excitingly portrayed, the visitor can learn about how cocoa beans are grown, how they came to be imported to Europe and made into the chocolate that we know today. How has chocolate changed over the years?, and what made Cadbury's so successful. It's all here. There is also an excellent factory shop where visitors can purchase a wide range of Cadbury products at factory prices. A restaurant/cafeteria can be found on site and there is a play area for children. Special features include a 3D video story and an interactive theatre which deals not only with chocolate, its manufacture and its advertising but also provides an insight into the Cadbury family who created the UK's favourite chocolate produce. U3 years are Free for entry to Cadbury World and no coach seat.